The Periodic Table of Content. From Orbit Media. Julien Smith’s post on “The Six Shifts of a Kindle Dominated Marketplace” got me to thinking about how this might apply to associations and other nonprofit organizations. Most associations are in the content (information) business. And, face significant challenges from competing content providers (other associations, for profit companies, publishers and even members). As I’ve written before, managing this content has become a central part of many organizations. Corporations, for example, are discovering the power of content for their marketing programs ... building the organization as a thought leader appears to build sales more than traditional advertising. Content drives connections, engages members and potential members and enhances the association’s reputation. Ebooks – the free ones – build your audience (prospects). Ebooks expand your association’s thought leadership position. Ebooks provide added value to membership. Ebooks positions association on important topics within the industry/profession. We used to call this position papers. Now, you can publish them as ebooks. 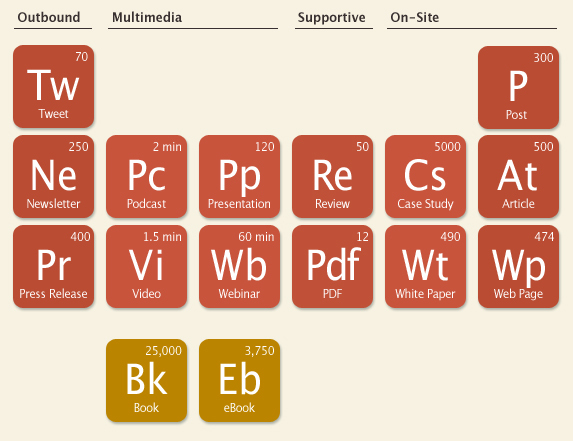 After drafting this blog, I discovered a copy of a great post called Content Chemistry: the Periodic Table of Content. Similar to the Book but shorter. Similar to the White Paper, but less formal and text-heavy. eBooks typically feature more design elements (charts and images) and can be created easily using presentation software such as Powerpoint or Keynote. Convert White Papers into eBooks. Combine articles with a similar theme into an eBook. This periodic table is a “keeper” as you look at developing/refining your association and/or nonprofit content management plans.